Check out what’s shaking in the workout world…literally! The Shake Weight is shaking up the arm-toning world. With videos on YouTube and a humorous spot on Jimmy Kimmel, the fitness device is getting attention. Although it looks like a battery-powered device when you see it in action, the movement of the 2.5-pound dumbbell is purely user generated. According to the company, the “internal resistance and shaft bounces the weight back and forth” to create an effective toning exercise. The product is said to increase muscle activity by 300 percent when compared to traditional free weights, which seems like a claim worth testing. When you buy the Shake Weight for $19.95 (plus shipping and handling), you get the dumbbell and a 6-minute workout DVD showing you how to use the product. Contrary to what most of the videos show, you don’t only use the weight in front of you (which I agree looks slightly inappropriate). You can “shake it” in any position that you would use traditional dumbbells for, thereby hitting your triceps, shoulders and biceps. You also stabilize your core for added ab benefits. The instructional DVD alternates between shaking the dumbbell as noted earlier and using it as you would a traditional weight. So how does the Shake Weight stack up as a workout? It definitely is exercise. Is it the hardest arm workout I’ve ever done? No. Will it give you Michelle Obama’s arms? I doubt if just six minutes is enough to give anyone MO arms. Would it be something you could do while watching your favorite fall TV shows? Sure. Would you want to use it in mixed company? Depends on your sense of humor. I’ve tried gyroscopic fun with the Jyze, and while I haven’t actually tried the DynaMax, it looks like an interesting way to shake up core work. From the makers of the Jenn-tested DynaFlex, the 3-pound DynaMax uses an internal gyroscope to give users added resistance. The faster the gyroscope moves, the more resistance the DynaMax gives the user. As Jenn has previously reported, the Power Plate is a vibration trainingdevice that is said to have all sorts of benefits, from increasing strength to reducing cellulite. The good vibrations help challenge you even more while working out—naturally stimulating muscle contractions 30 to 50 times per second—but now a study published in the Journal of Bone & Mineral Research found that body vibration technology can substantially increasebone density, making it a certifiable osteoporosis fighter! 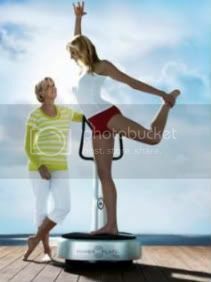 Check out the Power Plate locator to find a spot to try out the vibes yourself. Interested in trying the Shake Weight? Comment or email us at contact@fitbottomedgirls.com for a chance to win! U.S. residents only, please.